This is my week to see children's shows, and I'm loving it! 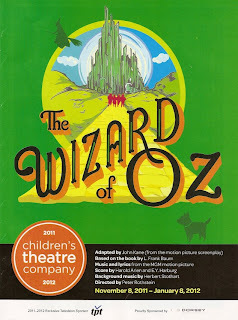 Earlier this week I saw the Ordway's magical production of Rodgers and Hammerstein's Cinderella, and two days later I saw a fantastic production of The Wizard of Oz at the Children's Theatre, beautifully directed by my favorite director Peter Rothstein. If I had to pick a favorite between the two shows it would be The Wizard of Oz, if only because it's a more well-known and beloved story, and the tale of a young girl learning that everything she needs to make her dreams come true is within her is something I appreciate more than the tale of a young girl who needs a fairy godmother and a prince to make her dreams come true. But both are really beautiful, well done productions that made me feel like a kid again. 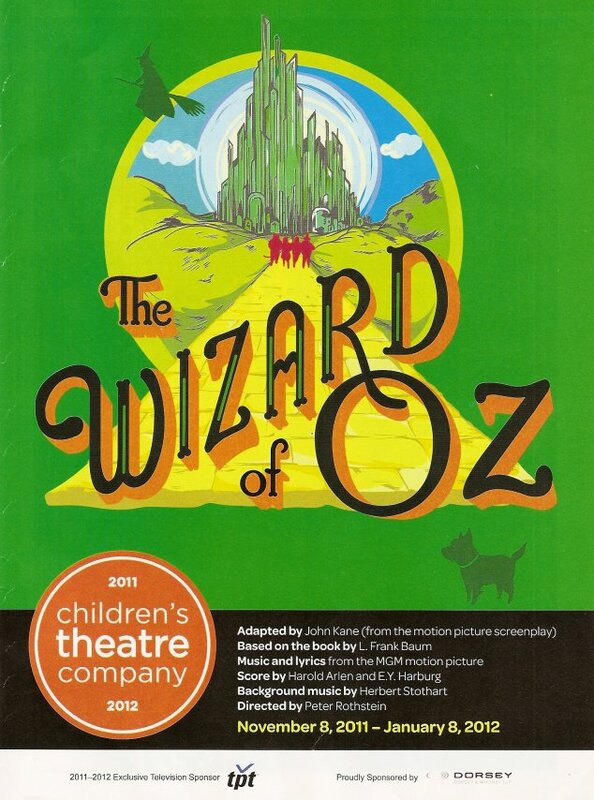 The star of the show is Maeve Moynihan as Dorothy. Maeve is a Children's Theatre regular (she made her debut as a munchkin in The Wizard of Oz in 2002), but I'm not, so I first saw her as Carrie in the Guthrie's world premiere of the Little House on the Prairie musical in 2008. I remember being impressed with her then, as I was when she played the young version of the title character in Theater Latte Da's Violet last year (one of my favorite shows of 2010). As Dorothy, Maeve is charming and believable with a beautiful full voice. She's so young (she just turned 18) and so talented; she has the whole world ahead of her. I can't wait to see what she does with it, and I only hope that after she becomes a big Broadway star she comes home every now and then to grace us with her talent. Dorothy's three friends are beautifully and perfectly personified by Dean Holt (Scarecrow), Max Wojtanowicz (Tin Man), and Reed Sigmund (Cowardly Lion). First of all, the make-up and costumes (by Helen Q. Huang) are spectacular and do a wonderful job of helping to create the character (and they get into and out of them fairly quickly). Each one of them has the specific movements of the character - the loose-limbed Scarecrow, the mechanical Tin Man, and the cat-like Lion - that the actors never lose sight of for a moment. I would be entertained just watching the three of them move and dance and interact for two hours. Reed's Lion is particularly entertaining. About his role in this spring's Annie I wrote, "Reed is almost over the top in his portrayal of Rooster, but it works." And that's true here too; he almost goes over the top but never quite crosses that line; it's brilliant, especially for kids. Another star of the show is little Loki, who plays Toto. He (she?) has to be the most compliant dog I've ever seen. S/he is passed back and forth, sometimes to some pretty scary looking creatures and amid loud noises and commotion, but is never frazzled or upset. S/he is onstage for much of the show, and just calmly hangs out in someone's arms, watching, standing where placed, occasionally eating a treat. I guess that's to be expected when the animal trainer (William Berloni) is a Tony award winner who has worked extensively on Broadway. The sets by Scott Bradley are simple, but colorful and effective. The spinning house and flying objects are kind of adorable, and the lightning flashes and crashes distract the audience while the set is being changed from Kansas to Munchkinland. This is one show where the lighting really helps create the sense of place (green for Oz, red for poppies). But some of the best effects are never seen at all. In several scenes the actors look off above the audience, at a tornado or the Emerald City or the wizard, and they're so convincing I had to fight the urge to turn around and see what they were looking at! And of course The Wizard of Oz would not be the same without the familiar wonderful music, beautifully played by the pit orchestra led by Victor Zupanc (who seemed to love interacting with the kids before the show and during intermission). As I said before, the costumes are just magnificent. The child munchkins are the cutest little things; one tiny one in particular I wanted to put in my pocket and take home with me! These kids are so enthusiastic and energetic, and really fine young actors. They're just children playing make-believe, in fabulous costumes in front of hundreds of people. It makes me wonder which of these children will be playing Dorothy in another 10 years. This was my last show of 2011, and the year couldn't have ended better. I've seen a ton of theater this year, more than any other year of my life (my year-end summary is coming soon), and this was a perfect finale to it. A story so familiar it's part of our cultural heritage, executed to perfection by the top talent in the area, a heart-warming and inspiring story. What a world, what a world!